Is this what life in the Kingdom looks like? My wife, Christy, teaches Kindergarten at St. Michael’s Episcopal School in the Bon Air neighborhood of Richmond. A few weeks ago she had to break the news to her headmaster that she had been diagnosed with breast cancer. The good news is (because she goes for an annual mammogram) her doctor caught it early. Christy was reassured that a little bit of surgery and some follow-up radiation would do the trick. And so, on October 2, she had a “little bit” of surgery. She has spent the last three weeks recovering and getting ready for radiation treatments, scheduled to begin today. 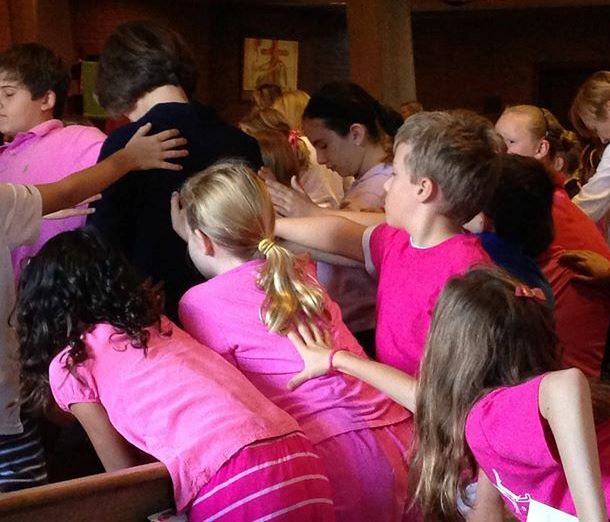 When she got to school this morning she found that everyone at St. Michael’s was wearing pink as a sign of support, and during chapel everyone was invited to join in a prayer for Ms. Somerville. A few of the children put their hands on her shoulders, and then everybody tried to get in on the action, leaning forward, reaching out toward a beloved teacher. Christy told me her hands were busy wiping away tears. At church lately I’ve been asking people what life in the Kingdom looks like, and wondering if it is that place where we bear one another’s burdens, and wash one another’s feet, and forgive one another’s sins. When I saw this picture my own question was answered. What does life in the Kingdom look like? It looks like this, like that place where children wear pink and say prayers for their teacher. May that Kingdom come everywhere, and not only at St. Michael’s School. Here’s a post by Susan Grant, who told me this story after the 8:30 worship service last Sunday. It was so good I told her to write it up and send it to me, and promised I would post it on my blog. She did, and I did, so here it is. Enjoy! Last Saturday I attended a Kathy Troccoli conference/concert at Goochland High School. It was an inspiring morning as Kathy emphasized what God can do in our lives through her theme “Hope’s Alive.” God spoke to me as she gave examples of how she intentionally interacted with strangers to which she felt drawn – like a server at Applebee’s, and a woman at the Nashville airport. Kathy and I are so different… she grew up on Long Island and can be very outspoken. For me, I tend to stay in the background and don’t pay attention to others I pass in a normal day. However as I left Goochland that afternoon, I asked God to give me a boldness like Kathy, to show me whose life I could impact for Him. That night God reminded me of a gentleman I had seen for years on Sunday mornings sitting on a bench on Patterson Avenue waiting for a bus. I had assumed he was leaving his nearby home to go to work as I was on my way to church at 8 a.m. Several times through the years I had considered stopping to say “hello” to him but thought he would consider me crazy for doing that. However now I knew what God wanted me to do. 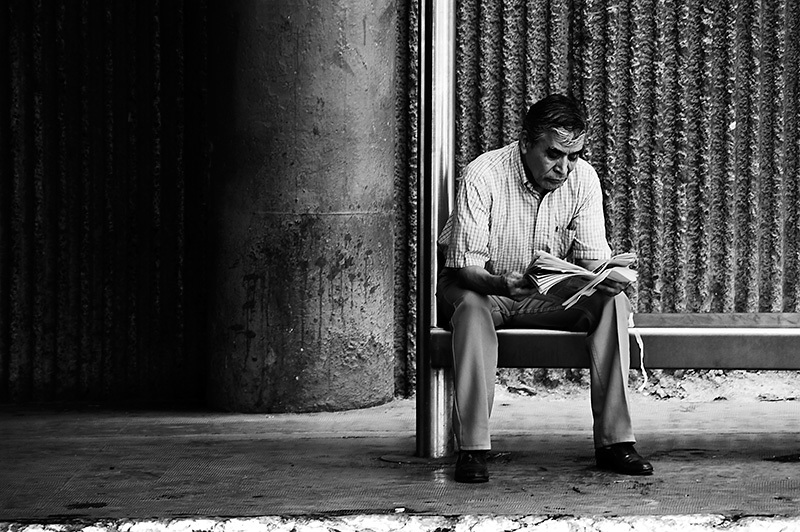 On Sunday with boldness and renewed confidence I pulled over into the bus stop. Quickly I walked over to this man with a backpack slung over one shoulder and introduced myself. I told him I had seen him for years as I drove by on my way to church. He surprised me by responding, “Yes, I’ve seen you, too.” I had never seen his eyes meet mine… he was always looking west on Patterson, searching for the bus coming his way. He introduced himself as Chris, saying he worked all night as a security guard at Agecroft Hall. I immediately told Chris I was heading to church and asked what I could pray about for him. With a surprised look on his face he mumbled, “Nothing.” I responded, “Nothing? With all the issues we all have to deal with you have nothing I can pray for?” Chris’ answer as he shrugged his shoulders, “I just try to work through it all.” As I headed back to my car I told Chris I would be praying for him that morning. We both waved to each other as I pulled out to drive the remaining eight blocks to church. Kathy Troccoli inspired me to plant a seed. Hopefully someone else will water it and God will make it grow. (I Corinthians 3:6) Perhaps on occasional Sundays I can stop to give Chris a sausage biscuit or Croissan’wich to take home to enjoy as his breakfast. I’m praying for myself – that inch by inch God can transform me into someone who can impact lives for God, person by person. Here’s a timely post from my friend Barry Howard, pastor of the First Baptist Church of Pensacola, Florida. Last week, as more and more cards and notes appeared in my inbox, in my mailbox, and on my desk, all thanking me for serving as their minister, I began to wonder if someone had announced my retirement without my knowledge, or if I looked a little discouraged and folks were just trying to lift my spirits. In my momentary amnesia, I had forgotten that October is promoted by many as Pastor Appreciation Month. Through the years I have been blessed to “feel” appreciated by the core membership of the congregations I have served. But I’m pretty sure that is not the universal experience of pastors. I am told by my counselor friends that many clergy are highly discouraged and often teeter on the brink of depression. I readily acknowledge that there are a few slackers among us, as there are in every career field, but most of the pastors I know work hard and feel a deep sense of responsibility for their flock. 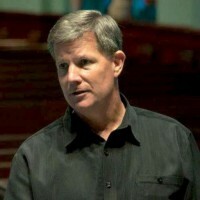 Because the multiple roles within the pastoral vocation uniquely initiate a minister into almost every conceivable life situation (as well as a few inconceivable ones), a pastor’s work from one day to the next can fluctuate between affirmation and discouragement. What is the best way to show appreciation to your pastor? Included in the stack of cards I have received, there is a Starbucks gift card, pictures drawn by a children’s Sunday School class, and hand-written notes thanking me for “that time when” I was there when grandpa passed away, when junior got married, or when the baby was born. Through the years I have been the recipient of all kinds of tokens of appreciation, including jars of homemade jam, home-canned pickles, home-cooked cakes and pies, fresh baked bread, or garden-picked vegetables. While I can’t speak for every pastor, here is what makes me feel the most appreciated: Faithful participation in the life of the church. For me, nothing can be quite as emotionally deflating as working hard all week, then getting to church on Sunday to discover that a high percentage of my flock is at the beach, on the boat, in the mountains, on the golf course, at the soccer game, or just sleeping in. And nothing can be quite as encouraging as working hard all week, and getting to church to see a faithful congregation of believers who have gathered to worship God. Early in my ministry, I suppose I took it for granted that church members would be fairly faithful, especially in worship and Bible study. Now, even among historically devoted church members, participation in the life of the church is too often determined by convenience than by conviction and commitment. This is Pastor Appreciation Month. Your pastor will appreciate your cards and notes, and jams and jellies. But if you really want your pastor to feel appreciated, be an active and faithful participant in your spiritual community. When I witness someone get connected and engaged in the synergy of God’s mission through the church, as a pastor, that makes my day. One Sunday morning it occurred to Ashley that she might visit a church. As she awakened, the thought lingered—it amused her. She smiled as coffee finished brewing and she poured a cup. Once visiting a church had been the farthest thing from her mind. Faith seemed like a crutch for the old and weak. Churches seemed irrelevant. Now she was exploring them. As a student Ashley was confident of her abilities and certain of her future. She moved smoothly through high school and entered a good college. There she began to envision a career and her personal life. Graduation was followed by a job where she began to advance. The young man she had dated became her husband. The world was set, just as Ashley intended. But Ashley’s world did not become what she had expected. The happiness she anticipated never materialized. For reasons she was still sorting out, both she and her husband had affairs. Counseling did not help, they divorced, and disappeared quickly from each other’s lives. “It’s the only thing we did well,” she mused. “We had nothing spiritual in common,” she thought often. Ashley paused again at the word “spiritual.” As she sipped coffee, she tried to remember when “spiritual” matters gained priority and even what the word meant to her. Was it when she lost her job, or when she joined a women’s book group? Did “spirituality” awaken when a new job took her across the country? She handled the job fine, but her personal life almost came unglued. Involvement with a married man and evenings with scotch became a downward spiral. Comments at work about sloppy performance struck home. She ended both destructive ties. Along the way “spirituality” became a key reference point. But more questions than answers surfaced: What did she believe and where did she belong? As these questions bore in on her, Ashley knew she needed to search, and as she searched the questions intensified. Was she alone or were there other people facing similar challenges? 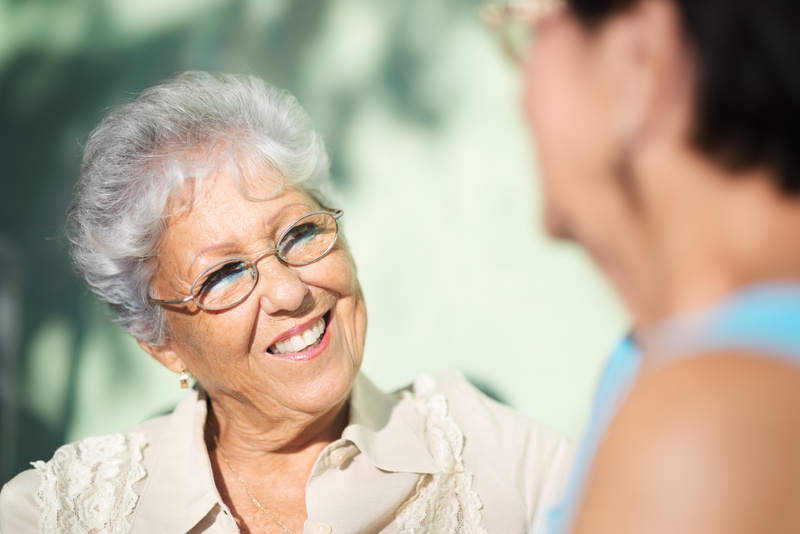 Was there something she could believe in that could give her deep roots in life? Was there something beyond her vague, agnostic existence? Was there a group of people with whom she might seek answers together? As these questions came into focus, the thought of attending a church first crossed Ashley’s mind. Initially the thought surprised her. It was uncomfortable and odd. A church? At first Ashley doubted there could be a congregation for her. Laughing at this bizarre idea, several friends discouraged her. The images of churches were not appealing. Ashley imagined stern morality and threats of eternal judgment. She imagined being coerced to believe ideas that were absurd or to take sides in disputes that seemed pointless. 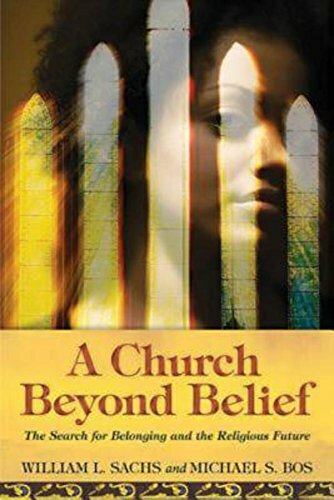 Ashley wanted belief and belonging churches did not seem likely to offer. But she resolved to explore a few congregations. Telling no one, and hoping not to be recognized, she set off one cold Sunday morning. How will Ashley be received when she comes to church? How would she be received at your church? What can we do to give people like Ashley a warm welcome, food for the soul, and a place to call home? If you’d like to read more of Bill’s book, you can get more information by clicking HERE.